Before anyone says it..yes I know the other week the this was on special offer for £2.50 each. But now that the product is no longer new & at a introductory price this is the best price. 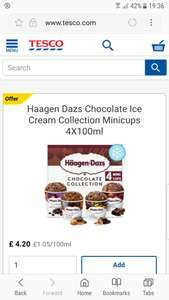 2 packs of Haagen Dazs minicups 4x100ml various flavours available for £7 in Tesco. Instore & online. they don't have heron in london though?